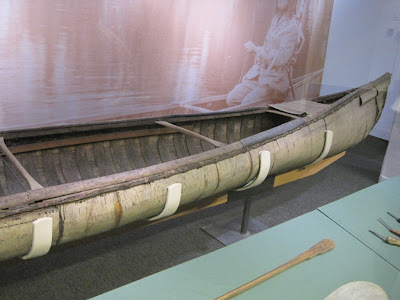 The Hudson Museum in Orono, Maine has a very nice Maine birchbark canoe from the nineteenth century, plus several related items. ca. 1888 From the exhibit signage: "This nineteen-foot river canoe was made for Charles Strickland, a prominent Bangor businessman for river drives. Made from thinner summer bark, it was designed for speed." 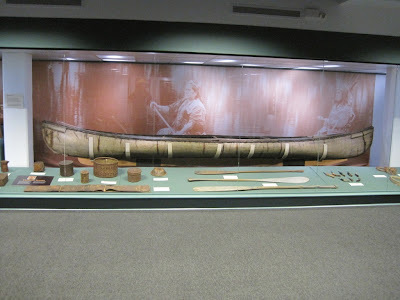 The huge photograph mounted behind the canoe is misleading: the people are reproduced larger than life, making this big boat look smaller than it really is. 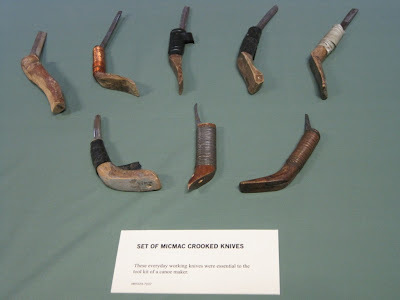 Micmac crooked knives -- the basic tool for building a birchbark canoe. Fancy crooked knives. The four to the left are c. late 19th/early 20th century, but no cultural identification was provided. The one in the upper right is Naskapi, c. 1900. More canoe materials. Top: spruce root used for sewing seams and panels together. Bottom: canoe ribs (probably white cedar); Center-right: pine rosin (dried sap), melted then heated for sealing seams. 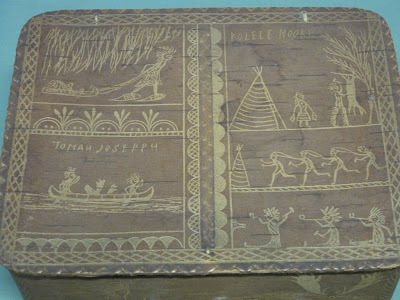 From the exhibit signage: "Birchbark Box by Tomah Joseph. c. 1900. 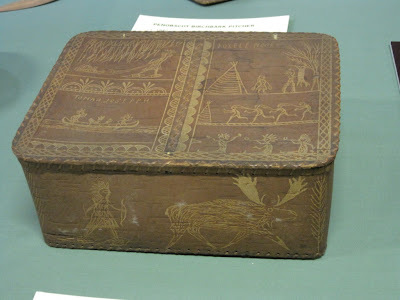 Each section of the box is decorated with motifs, including hunting scenes and images from Passamaquoddy legends, such as rabbit the magician and wildcat." I'm including it here and below for the canoe illustration. 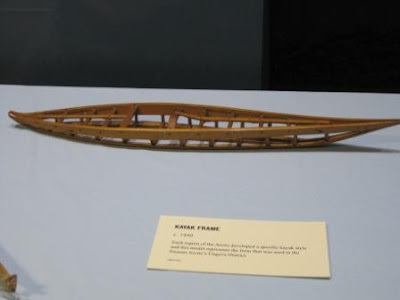 The work of the Passamaquoddy Tomah Joseph, by the way, appears in Adney & Chapelle's Bark Canoes and Skin Boats of North America . Last summer, bark canoe maestro Steve Cayard and a team of Native American craftsmen built an authentic Wabanaki-style bark canoe on the grounds of the Penobscot Marine Museum in Searsport, Maine. 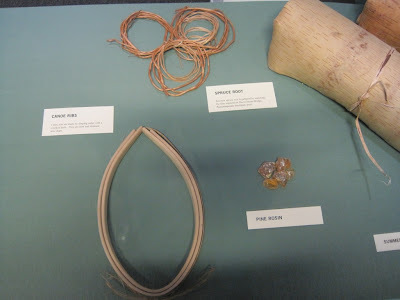 The building team consisted of a half-dozen Passamaquoddy, MicMac, and Penobscot Indians, and the project had two main objectives: to teach this culturally critical skill to the descendents of the people who developed it, and to demonstrate the process to the public at large. I blogged about the project a number of times (click the index link for "bark canoes"), and documented it in a series of more than 100 photos. The finished boat was launched in a brief ceremony at the 2009 Maine Boats, Homes & Harbors show in Rockland, and that was the only time the canoe has been in the water. It is still a brand new canoe. Now, the Penobscot Marine Museum is auctioning the canoe, to raise funds to repeat the project in 2010. The objectives, again, are to teach canoe building to Native Americans so that they can perpetuate the knowledge within their own cultures, and to demonstrate this fascinating and unique construction method in an area where boatbuilding skills are in no short supply, but where the bark canoe is, as everywhere else, a real rarity. Go here for more details on the auction and to purchase tickets. The drawing will be July 1, and of course you do not have to be present to win. The winner will, however, have to pick up the boat; it won't be shipped. This will give the winner a great opportunity to visit Maine and, if the winner is one of my readers, to get a tour of a great marine museum by none other than your dedicated blogger. Heck, I'll even buy coffee. 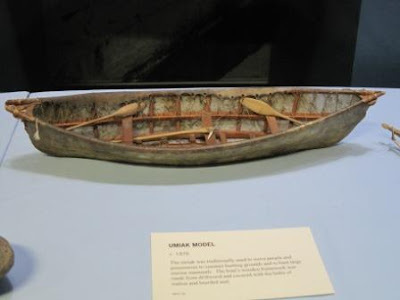 The Hudson Museum of Anthropology at the University of Maine, Orono, has several nice models of indigenous boats on display, in addition to the ceramic model of a reed boat from Peru's Moche Valley that I showed in a previous post. 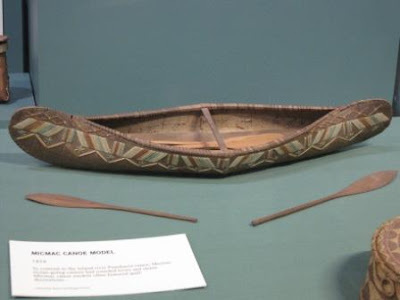 I'll quote the exhibit signage: "Iatmul Canoe Model, c. 1980. Crocodile canoes or waivara were used by bands of sorcerers to pass magically up and down the river, traveling just beneath the water, like a crocodile." The Iatmul people are from Papua New Guinea, and maybe the sorcerers think they travel beneath the surface, or maybe try to convince others that they do so, but the signage says they actually do so. Hmmm. Anyway, it's a nice piece of sculpture. 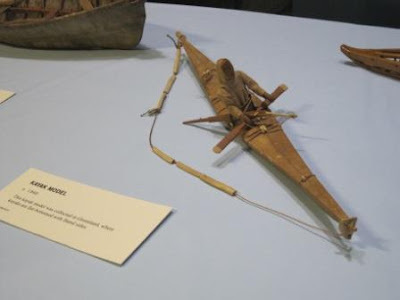 Model of a Micmac ocean-going canoe, decorated with dyed porcupine quills, along with paddles. c. 1856. Like many boat models made by indigenous people, this one is lacking in accuracy in many respects, but it is lovely nonetheless. It was probably built as a souvenir for the tourist trade. Scattered among various exhibit cases at the Hudson Museum of Anthropology (see previous post for a brief introduction) is a nice collection of canoe paddles. Another paddle from the Amazon, c. 1950. 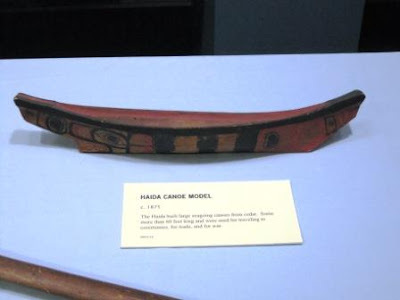 A Tlingit paddle, c. 1880. If anyone can make out the design motif on this, please post to the Comments. 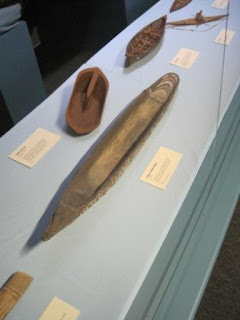 Three paddles from Maine, probably all Wabanaki and probably all carved with crooked knives. The top one must have been well-loved: note how it was mended with metal straps. The middle and bottom are long stern paddles. The same three paddles as the previous photo. Interesting segmented extended grip on the longest one. The Hudson Museum a brand new museum associated with the department of anthropology at the University of Maine, Orono (near Bangor). Rather small, it nonetheless has fine exhibits, is well worth a visit, and has a surprising number of boat-related artifacts on display. I'll try to cover several of their boat artifacts in a series of posts. 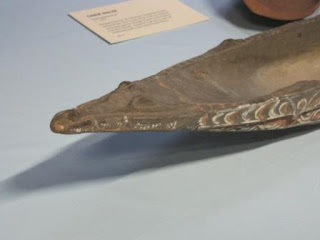 For now, we'll look at an interesting ceramic boat model from the Salinar culture of Peru's Moche Valley. The Salinar were precursors of the Vicus, developing in Moche Valley. 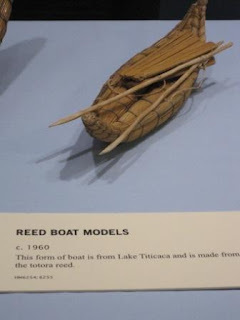 The vessel depicts a man on a reed raft, similar to the ones studied by Thor Heyerdahl and used as models for Kon-Tiki. 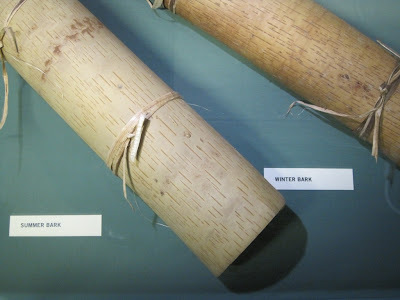 I don't quite follow the Kon-Tiki reference, since that raft was made of logs, not bundles of reeds. 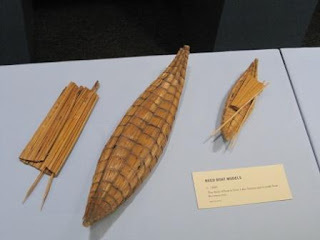 The model's shape is reminiscent of a reed float composed of one longer central bundle flanked by two shorter bundles. 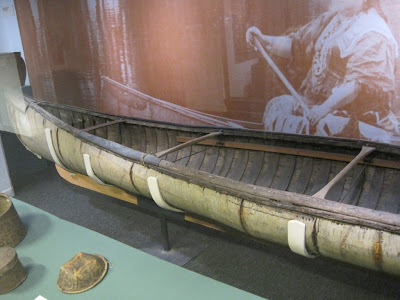 It's also quite reminiscent of a log jaganda -- a Brazilian raft-boat that I've blogged about several times. I'm not suggesting that the model depicts a jaganda -- only noting the similarity. This isn't just a simple model, however. It's a "whistling jar," a noisemaker or musical instrument of a type made in a great variety of styles and designs by this culture, depicting people, animals, vegetables, and in abstract designs. The diagram below shows how it works.